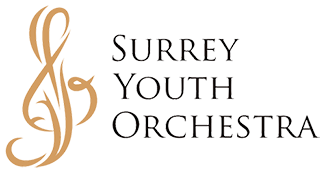 Surrey Youth Orchestra welcomes musicians age 8 – 18 to audition for our 2019/2020 season. Auditions take place at Surrey Christian High School located at 15353 92nd Avenue on May 25 and June 1 from 9:00 am to 12:00 pm. You must pre-register to audition. 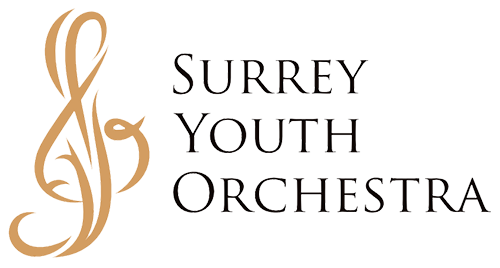 The Surrey Youth Orchestra rehearses weekly from September 7, 2019 – May 9, 2020. Orchestra member is expected to make a commitment for the year and attend all rehearsals. Conductor Andrea Taylor leads this orchestral experience for string players of new ability. The Prelude Strings is designed to teach beginning ensemble skills, musical interpretation as well as rhythm development, rehearsal etiquette, and note-reading skills. Requirements: reading and playing at or above Grade 1 RCM or end of Suzuki book 1. Students must display proficient technique at their repertoire level. Intermezzo Strings perform music that will build upon theoretical and musical concepts covered in the Prelude Strings. Emphasis will be given to listening skills as related to playing in a large ensemble. Conductor Andrea Taylor chooses contrasting repertoire to introduce students to a variety of musical styles. Requirements: reading and playing at or above Grade 4 RCM or Suzuki book 3. Students must display proficient technique at their repertoire level. Under the baton of conductor Ben Goheen, the Symphonic Strings performs major repertoire from the standard string orchestra literature while learning the skills needed for excellent orchestral playing. Requirements: reading and playing at or above Grade 6 RCM or Suzuki book 5. Students must display proficient technique at their repertoire level. Under the direction of conductor Joel Stobbe, this premiere full symphonic orchestra is comprised of students who demonstrate strong musicianship and highly advanced technical level. The group performs a wide range of demanding orchestra repertoire. Requirements: playing at or above Grade 8 RCM. Students must display proficient technique at their repertoire level.